Caring for our elderly parents might be the most challenging task we will ever face. Their needs and moods vary from day-to-day but still, we need to keep them close to make sure that they are comfortable and they are well taken care of. Caring for an elderly will pose a challenge to everybody in the household because of the responsibility at hand. We need to take care of everything, from the time they wake up until the time that they go to bed. That’s too many tasks added to your usual daily routine. Families nowadays prefer in-home care services, it is more convenient, secure, and less time-consuming. Getting in-home care services let us manage our time with our daily routine and time for our elderly loved ones. Gone are those long trips that we need to take every now and then to visit our loved ones in care homes. One advantage that we get out from hiring in-home care services is that we can have trained eyes who can look after our elderly loved ones. We should not take this for granted because this is the age group wherein the body system is very fragile. Having a regular caregiver for our elderly loved ones helps us in establishing a baseline to their health status. A baseline is a mark which shows what is normal for them. Anything that deviates from it, whether it’s a spike in their blood pressure or the loss of appetite, has to be considered and checked thoroughly. Consider your loved one’s medical history, knowing this ahead of time gives you an idea of a care plan that suits them well. Do they have a history of seizure? Allergies? Increased blood pressure? These questions have to be answered initially when caring for an elderly. In-home care services will also guarantee that simple tasks like rehydration is always in mind. Our elderly loved ones may not feel thirsty like how they used to be when they were still young, they might not even notice at all that they haven’t drank water for the past few hours. That is why it is very crucial that we have a caregiver solely focused on the care of our elderly loved ones. 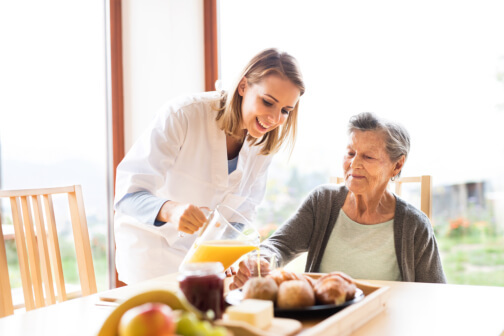 Heaven Sent Home Support Services, a provider of In-Home Elderly Care Assistance in Southeast Michigan, understands the importance of prioritizing the healthcare needs of loved ones at the comfort of their own homes. We have Home Care Services in Oakland Counties, Michigan, 24 hours, 7 days a week. We also have personal and basic care services to make sure that they have the assistance they require from the time they wake up until they go to sleep at night. With In-Home Elderly Care Assistance in Southeast Michigan, your loved ones are being looked after like you would have done it yourself. In short, we take care of our clients like family! This entry was posted in Home Care and tagged Elderly Care, health, Healthcare, In-Home Care. Bookmark the permalink.